Ninjas in video games are, generally speaking, pretty darn awesome. Whether it be Ryu from Ninja Gaiden or Genji from Overwatch, awesome is definitely how I’d describe them. Didn’t have to spend a lot of time in Cyberdrome‘s arenas either, to find out just how addictive dashing through the air and slashing robots with crazy slow-motion sword moves for a high score can be. Ninja hype! 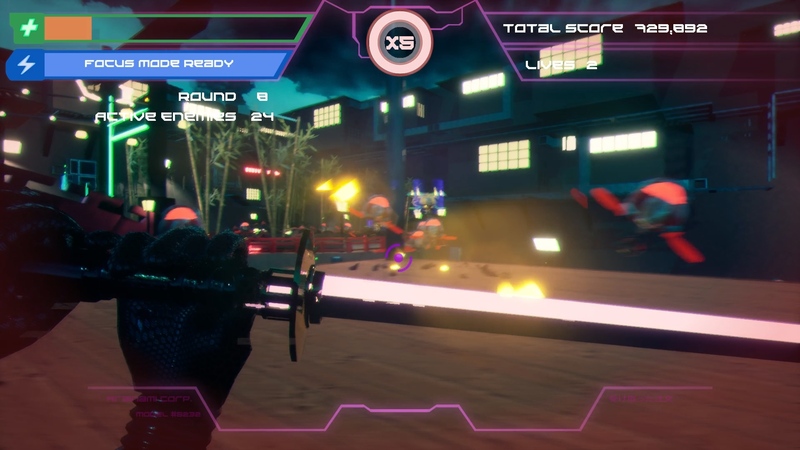 Armed only with a sword – which can somehow deflect (most) bullets – the ability to double jump and dash through the air, the game’s faceless protagonist is immediately thrust into fast-paced wave-based carnage against colorful robots. No tutorial, no explanation, no story. Just you and them, so best get to slicing and slashing, as otherwise that #1 leaderboard position will never be yours to claim. Red robots, blue robots, green robots, shielded robots, ranged robots, melee robots – so many robots, and in a handful of very different arenas. My favorite? Honestly, all three of them are great and each different enough from the last to stand out as a great place to scrap some robo– oh right, almost forgot: they’re apparently called drones. Just droning (sorry) about their business when you jump into the area, tearing them apart for no reason. Unless of course you count that elusive high score, in which case, I guess you’ve got a reason to be an evil you-know-what, destroying defenseless drones. Only… they’re actually the exact opposite. With no way to increase the life count beyond that initial three and a finite number of green drones in each wave which, when killed, replenishes the player’s health, the need to be careful can not be stressed enough. Doesn’t mean you can just hide in a corner, as these things will come looking for ya (and the combo meter is also kinda important, ya know). Should things get overly dicey though, you can always make use of the game’s ‘focus’ feature – provided there’s any left of course. Also, I may have been abusing it ever so slightly to locate enemies easier. But shh, that’s just between you and me. All that said, while some might find the experience a tad simple, those who enjoys their score-chasers fast and furious with a hint of supernatural ninja stuff and robots… should certainly give this one a go. The lack of a fov slider and being unable to disable motion blur, while unfortunate, certainly didn’t stop me from having an absolute blast with Cyberdrome. Cyberdrome is available on Steam, for free.